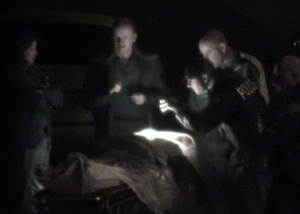 This is a screen grab from the video a Baldwin Park man shot Monday night while detectives and coroners investigators look over the body of murder victim Oscar Garcia. Not sure who everyone in the picture is, but the man in the center appears to be a coroner’s investigator. The man with the flashlight is obviously a BPPD officer or tech. There are other scenes in this video, but most are too graphic to display here. This entry was posted in shooting by Frank Girardot. Bookmark the permalink. finally ur killer has been caught and i hope he ROTS in jail!!! How u so sure anonymous?? at least put ur initials? Is the killer convicted already? No! I think they got the wrong guy!! No. I think they got the wrong guy!!! They got the right guy.. And I agree I hope u ROT in jail as well in Hell!!!! sorry but he will not rot in jail…and for sure not in HELL!!!! I’m wondering y if Konor was so down why is everyone saying he wasn’t a gangster…. I dont care he got 40 to life and hope its the worst expirience he will live in his whole life time… u people have no shame still speakin of him after hes been good for yrs.. Who ever u are (bp) let his soul rest in peace and his image continue on through our son. And we celebrate the presence he once gave us we also celebrate it through the blessing god gave us. And thatS my beautiful son lil oscar! Honestly that is the best thing that could have ever happen to you and your son. You and your son will be better off w/out him. Sad to say but true. Suggestion keep lil oscar away from his f*c>e@ up family and especially away from gangs!! and sorry to say but maybe he got what he deserved, maybe sum1’S payback or even Karma. Anywho, best of luck to you and your lil boy now I feel you will have a future w/out him.